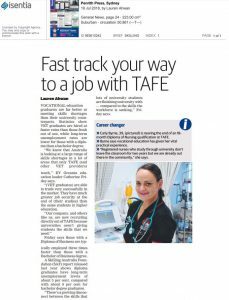 “We know that Australia is looking at a large range of skills shortages in a lot of areas that only TAFE (and other VET providers) teach,” EY Oceania education leader Catherine Friday says. “(VET graduates) are able to trade very successfully in the market. They have much greater job security at the end of (their studies) than the same students in higher education. Friday says those with a Diploma of Business are typically employed three times faster than those with a Bachelor of Business degree. “There’s a growing disconnect between the skills that lots of university students are finishing university with . compared to the skills the workforce is seeking,” Friday says.